Pepperoni & Cheese Stuffers | P&S Bakery Inc.
Our stuffed pepperoni breads can meet all your needs, including school lunches, vending, convenient stores, fundraising or walk-in pickup for your kids at home. Sliced Savory Pepperoni and melted creamy Mozzarella Cheese stuffed in a golden brown baked crust. Sliced Savory Pepperoni and melted spicy Pepper Jack Cheese stuffed in a golden brown baked crust. Sliced Savory Pepperoni and melted creamy All American Cheese stuffed in a golden brown baked crust. Overloaded Sliced Savory Pepperoni and melted creamy Mozzarella Cheese stuffed in a golden brown baked crust. Sliced Savory Pepperoni, Italian Sausage and melted Mozzarella cheese stuffed in a golden brown baked crust. Sliced Savory Pepperoni, Sweet Honey Ham and melted Mozzarella Cheese stuffed in a golden brown crust. 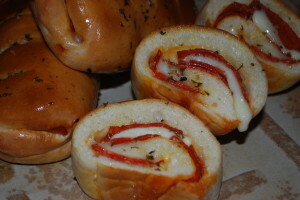 Our stuffed pepperoni bread is fully baked and ready to serve.